*Sulu came from a commercial pack string in Wyoming. *Sulu has produced one therapy baby so far! Click HERE to see Sulu Offspring! When High Trail llamas announced they were getting rid of most of their packers, we immediately inquired about Sulu. He was unrelated to any of their own lines. Based on what we knew of his bloodline and history, we felt pretty confident that he would cross well with our Toby daughters. Sulu is also not related to many of the common and overused packing lines. As an added bonus he is already an exceptional pack llama with many trail miles to his resume'. Best of all, he is an absolute sweetheart! We were overjoyed to find out Sulu has the most laid back and easy going disposition for a breeding male. Additionally, he has ample muscling, strong conformation and bone! He has been a pleasure to work with so far and it is obvious that his former owners put a lot of training into him. 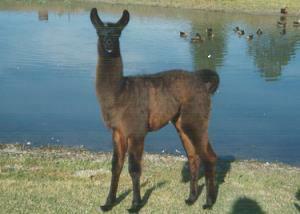 We are very excited to have him here and his first babies arrived in the Fall of 2013. For more information on Sulu, please contact us. We have had numerous Sulu babies out of our animals and outside services. We only took him out once and he did well!